Canape is the French word for sofa and in today's parlance it's meant to describe a sofa from 18th century France, where it was made in one of several forms, often with matching chairs. The literal origin of the word has it meaning a covering or netting, as for a bed, and for that reason the word canape is often confused with canopy. The former, in all probability, gave rise to the latter. To further confuse things, a canape can also mean a small piece of bread or a cracker that has cheese, meat, fish, or other foodstuff on top of it that is often served at a party. The pair of canapes shown here were actually made in the 20th century, but can still be called canapes because they are so true to their descendants in look and style. 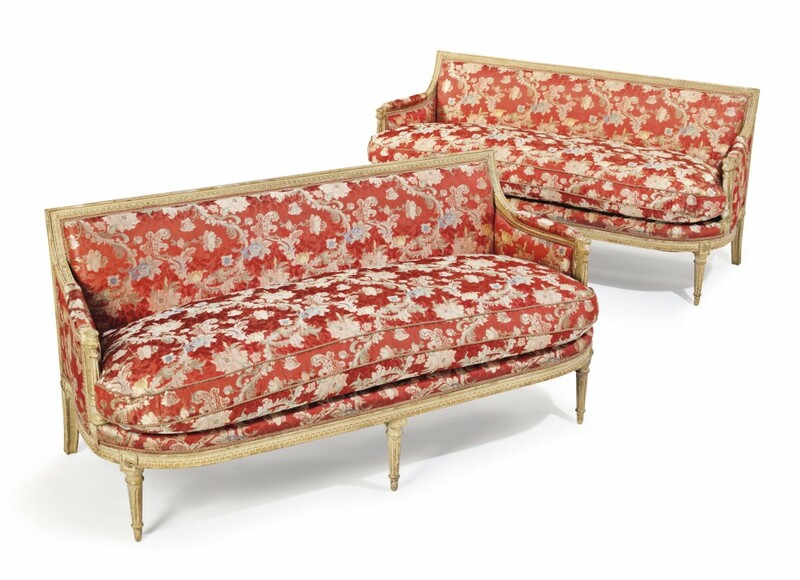 They were previously owned by none other than Joan Rivers and were featured in a sale of items from the late comedienne's estate held online from June 18-23, 2016 by Christie's in New York. 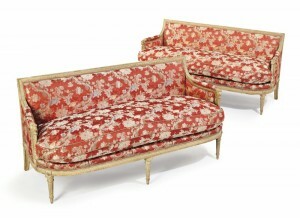 These Louis XVI-style cream-painted sofas each featured a rectangular back and seats covered in red floral silk. Both were 65 inches wide and were sold together as one lot. The winning bid was $37,500.